Mayor Martin J. Walsh and Las Vegas billionaire Steve Wynn have struck a deal over the casino mogul’s plans for a $1.7 billion gambling palace in Everett, under which the city will drop all legal efforts to stop the casino in exchange for an extra $6 million over the 15-year term of the agreement. The deal, described by Walsh on Wednesday evening and confirmed by Wynn Resorts , brings to an abrupt halt the mayor’s long-standing and hard-nosed opposition to the massive casino and hotel complex planned for Boston’s northern doorstep. Walsh’s legal battle against the resort casino has cost the City of Boston $1.9 million in legal fees, including expenses resulting from a lawsuit that a judge threw out in December. With a negotiated deal, the former adversaries pledge to cooperate in addressing the momentous challenges involved in opening a 3 million square-foot resort in an urban area already plagued by congestion, particularly the Charlestown neighborhood of Boston. The agreement also instantly brightens the prospect that the state can begin to reap some of the benefits promised by the 2011 casino law: thousands of new construction and permanent jobs, and hundreds of millions of dollars in new tax revenue. “We fought the good fight, but at the end of the day, the judge dismissed our lawsuit,” Walsh said. He said he expects some casino opponents in Charlestown to be upset with him for coming to terms with Wynn, but ticked off some of the benefits to the neighborhood, such as money for youth group activities and arts programs, and millions of dollars for a long-term fix to the chronic traffic woes of Sullivan Square. Under the terms of the pact, Wynn Resorts agreed to slightly sweeten the deal that the casino company assented to two years ago, when the state Gaming Commission imposed a $1.6 million annual payment from Wynn to the City of Boston to offset the impact of the casino. That earlier compensation package also called for Wynn to pay $25 million toward a long-term plan to alleviate traffic in Sullivan Square, one of the worst bottlenecks in the state. The new agreement maintains that $25 million expenditure, but bumps up the annual contribution by an extra $400,000, which will amount to $6 million over the life of the deal. The new agreement also requires Wynn to pay Boston $750,000 to defray the cost of legal and other fees in connection with the negotiations of the deal, which was signed on Wednesday. The city will collect a one-time, up-front payment of $1 million, which was also required under the old package. 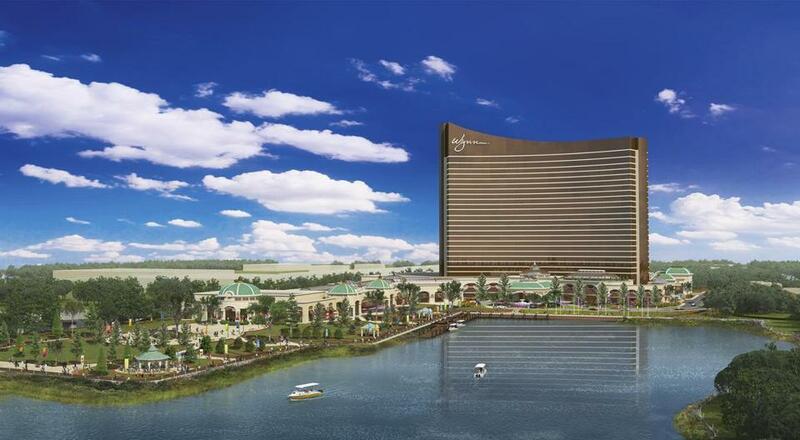 In one key concession, the city agreed to eliminate a provision in the state-imposed compensation package that would have penalized Wynn for as much as $20 million should traffic to the site exceed certain levels. Instead, the agreement requires Wynn to address excess traffic, if it occurs, with a specified list of improvements, such as recalibrating traffic signals. In a further sign of the new cooperation, the parties agreed to talk about how they might create, at Wynn’s expense, a park out of city-owned land that abuts the casino site. Walsh said the talks could result in the removal of an adjacent facility that handles sludge from across the city — a homely and unloved property that draws a lot of truck traffic. Wynn’s overall construction plan, which calls for a 24-floor, curved glass tower casino on the waterfront of the Mystic River, is projected to generate 4,000 construction jobs, 4,000 permanent jobs, and annual state taxes topping $200 million. The resort casino is now slated to open in late 2018. The payments to the City of Boston, laid out by Walsh Wednesday and contained in a 12-page agreement provided to the Globe, are separate from the state requirement that Wynn, like the state’s other resort casino operators, hand over 25 percent of their gambling revenue in state taxes. Also unaffected are state-mandated payments — $30 million upfront plus $25 million a year in real estate taxes — Wynn must make to the city of Everett. In the interview, Walsh recalled a crucial meeting last fall at a time when the two parties were publicly bickering. After lawyers for both sides began to get bogged down in arguments and counter arguments, Walsh banished everyone from the room and he and Wynn sat face to face. Walsh said they wound up swapping stories about their childhoods — Walsh grew up in Dorchester, and Wynn regularly visited relatives in Revere — and in the process established what Walsh characterized as a lasting rapport. As to the war of words the two men engaged in last year — with Walsh flinging around allegations of corruption and Wynn threatening the mayor with a defamation suit — Walsh said all its forgiven, if not forgotten. Walsh attributed his clash with Wynn, at least in part, to his rookie status as mayor when he took on the casino issue months after his election in 2013. “It was a young administration, our first days in office,” he said. Walsh’s adamant opposition to the Wynn casino contrasted sharply with his approach to a rival proposal for a casino on the grounds of the Suffolk Down racetrack in East Boston. Before the state gambling commission made its final vote to award the coveted license for a Greater Boston casino to Wynn, Walsh announced that he had reached a deal with Mohegan Sun. That rival proposal would have landed the city a one-time payment of $30 million, plus $18 million per year. Walsh’s legal battle suffered a serious blow when Suffolk Superior Court Judge Janet Sanders summarily dismissed the city’s 150-page complaint after a single hearing. “The Commission looks forward to reviewing the details of the agreement and views this development as significant progress toward the awaiting jobs and economic development for the Eastern Mass region,” according to the statement.